Traditional methods for making paper mache involve boiling water, glue, and newspaper. Not only can this be dangerous for young children to try, the newspaper ink usually stains your pots. Thankfully, there are much easier ways to go about making paper mache paste. 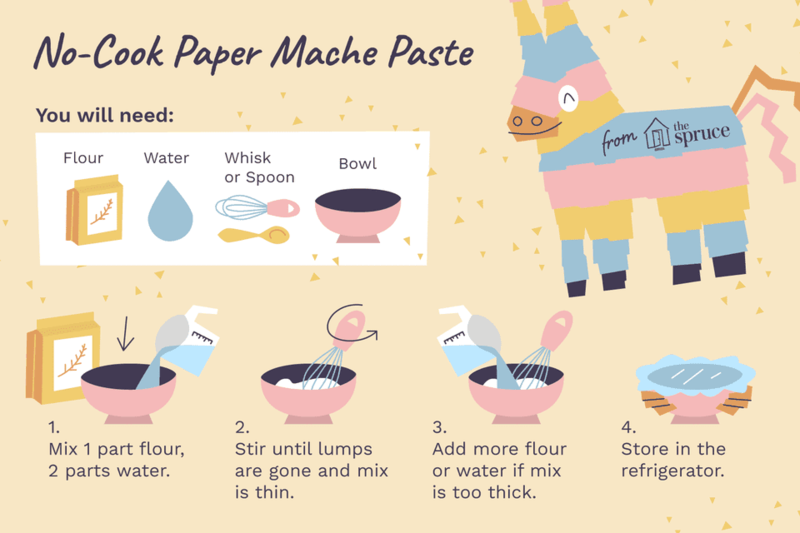 This is definitely the easiest paper mache paste recipe you can make. It's simple, non-toxic, and inexpensive. You will only need a few supplies, which you probably already have around the house. When you're ready, grab the kids and dive in. It's a fun project and they'll love the goopy texture. Better yet, you'll love the easy cleanup. To make this paste, you will need one part flour to two parts water. You can make as much paste as you need for the project. If you need more, it's rather quick to mix up another batch. Pour the flour and water in a large bowl and stir it well. You want the mixture to be thin, with a consistency similar to pancake batter. Keep mixing until there are very few lumps left. Use a whisk or a hand-held blender to remove any remaining lumps. Add more water or flour as necessary until the mix is runny like a white glue, not thick like a paste. You can store this glue in a covered bowl or jar in the refrigerator for a few days. If you don't like the smell of the glue mixture, add a pinch of cinnamon to sweeten it up. You can add a few drops of food coloring to the glue to give it some color. Use care as food coloring can stain fabrics. If you live in an area with high humidity, add a few tablespoons of salt to help prevent mold. Though it is uncommon, some people with sensitive skin may have an allergic reaction to the flour mixture. A mild rash is the most common reaction. If your child has very sensitive skin, a pair of rubber gloves will protect them. Paper Mache Pinata: Make this project for any party, especially birthdays. Make your paper mache pinata, let it dry, then fill it with candy. Paper Mache Globe: Cover a balloon with this paper mache mix and let it dry. Once it's dry, pop the balloon, and it's ready to paint. Paint it with blue and green to represent the Earth. It can even be incorporated into a science fair project and used to represent other planets. Paper Mache Volcano: Another fun science experiment, use your new paper mache skills to make your very own volcano. With a few common household items, it even erupts with red lava. Paper Mache Spiders: While you're getting all crafty for that Halloween party, create your own family of spiders. The technique is similar to the globe and it's a lot of fun. Paper Mache Bowls: Whether you can't get enough paper mache or have leftover paste from another project, paper mache bowls are an easy option. It's a useful craft that can hold all your trinkets and be painted in many fun ways. In French, paper mache means "chewed paper." In ancient Egypt, coffins and death masks were often made from cartonnage, a type of paper mache. As early as 1540, paper mache was used to make doll heads.